I can’t tell you how many times I hear this question come up in the context of homeschooling: What can I do to keep my toddler occupied so she/he doesn’t constantly interrupt and derail our school? Begin training to sit on laps quietly for several minutes. Begin training in solitary playtime. So first, accept that you have a toddler and that you are in a specific season of life. That means life (and school) will not be perfect. Life (and school) will not even be smooth. Toddlers are needy and active. Interruptions are the name of the game. Expect them. This stage is also very precious, and passes all too quickly. You are needed to nurture these little people, while at the same time educating your bigger little people. It feels like one of the Great Injustices of homeschooling. But here’s what you’re going to do: you’re going to pare back, first on school, and then on everything else you can. It is time for efficiency mode, so you can care for ALL your kiddos. Pared-back school should look like this: Reading, writing, and math. And if your students are under eight, you can drop the math or do it orally. If you are doing (or trying to do) six or eight subjects with each student, then you need to get realistic. I promise one day your children will grow up and you can add more subjects. All right, next I suggest teaching your toddler how to sit on a lap for an extended period of time. By extended, I mean around 20 minutes. This would give you enough time for a read-aloud or a nice chunk of math instruction, while at the same time giving your toddler physical closeness. Sometime when you’re not trying to do school, start holding the little wiggler (without a screen) for five minutes at a time. Calmly tell him no if he tries to get down. Ignore any fussing. Then when the five minutes are up, praise him up and down and let him go. Do this a couple times a day, adding five minutes at a time when you think he’s ready. (Of course don’t try this when they are hungry or needing a nap.) Having a child who will sit quietly for a period of time is a great benefit for many different contexts! 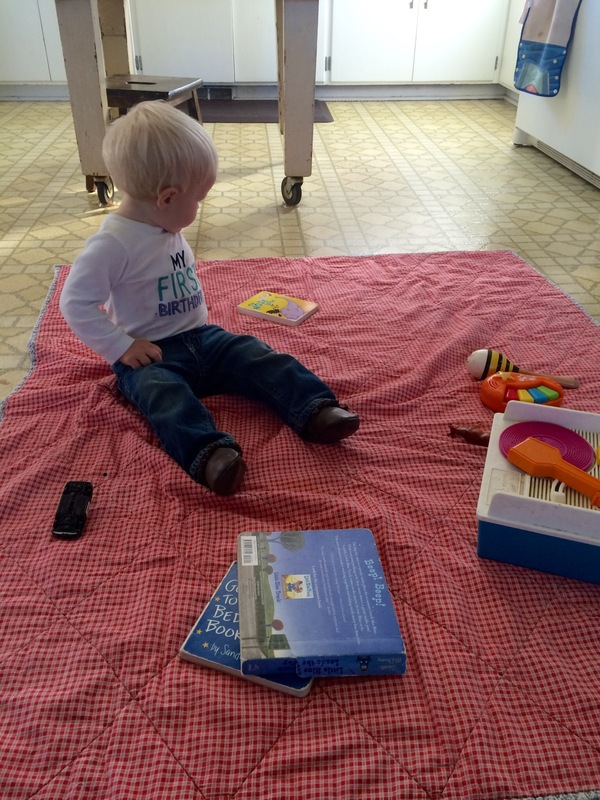 Another crucial skill to work toward with your toddler is the ability to play by himself quietly. Again, you start with small bits of time and work up. But by the time they are three a child should be able to amuse himself for 30-60 minutes at a time. With the advent of the more compact Pack n Play, our generation has forgotten the value of the old playpen. Google “play yards” and get yourself one. A Pack n Play will work if you are tight for money or space. Place a fed and well-rested offspring into the play yard with some toys and leave him there, preferably in another room, but where he can still hear and see you. Don’t get bent out of shape if he complains. Just smile and wave at him or come in to give him kisses without picking him up. A couple of my children actually liked going up to their rooms at times. When they got especially crabby or intense, I would take them up, put them in their crib with some toys, and they settled right down. Some people like to get special toys that are used only for this time, to give it a positive association. As the child grows, you can transition from the play yard to a play room, or play corner, again in a different room from the HSing activity. Look on Pinterest for some ideas on how to create a magical little corner they can call their own. Of course ours also played in the same room at times if they were quiet, but I think it’s important for them to learn solitary play also. It is healthy for children to realize that, while they are loved, the world doesn’t revolve around them and other people have needs too. At the same time it demonstrates to your older children that you care for them and their education. And finally, there is always Naptime. Or there should be. At our house, naptime is non-negotiable until children are school-aged (and sometimes after!). Learn to utilize this valuable time for schooling. I am often burned out myself by this point (2pm at our house), so I use this timeframe for more relaxed independent work, such as reading, copywork, journaling, etc. Math doesn’t work as well this late in the day, but do what you have to do. If you have a toddler that can sit on your lap for a couple sessions, play by himself for while, and takes a nap, that should give you some time to cover the 3Rs with your students. It may be tempting to find workbooks that they can “do themselves,” but it’s best if the skill subjects (3Rs) have regular oversight and input. Independence will eventually come with training and maturity. I have heard many large HSing families address the toddler issue by having older children take turns occupying him while taking breaks from schoolwork. I never felt we had enough children (or time) for this approach, but it works for many. Another helpful hint I’ve heard: before beginning school with your students, spend a little time cuddling or reading to your toddler. It helps fill their little love tank for the morning and you will begin your day without guilt or fears of being neglectful.